The Cards talk // bring cards to life! Narrattiva already uses Aurasma as cover enhancement on some game. 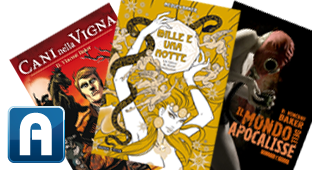 Download the app, subscrive Narrattiva channel and take a good look at "Cani Nella Vigna", "Il Mondo dell'Apocalisse" and "Mille e una notte". With Aurasma, the game cards animate in augmented reality allowing the characters to come to life and explain themselves. Once framed with a smartphone or tablet, the Baccanalia cards will become animated and explain to the player their rules. 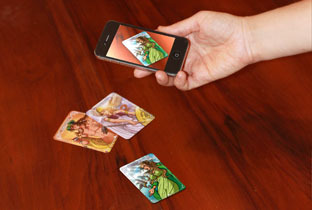 This is the first time mobile-based augmented reality is used this way with a card game. Aurasma is the world’s leading augmented reality platform. Available as a free app for iPhones, iPads and high-powered Android devices or as a free kernel for developers, Aurasma uses advanced image and pattern recognition to blend the real-world with rich interactive content such as videos and animations called “Auras”. Auras can be created for printed images, product packaging, clothing, physical places and users can even use the app to create and share their own. Since its launch in June 2011, Aurasma has had more than four million downloads and over 6,000 partners in markets including retail, fashion, sport, automotive, education, advertising and publishing are using the free technology in their campaigns, on their products or embedding the technology in their own applications. Aurasma was developed by and is part of software company Autonomy – an HP Company. The town of Bertinoro lies on the hills, home to a centuries-old wine tradition and hosts to InterNosCon, the main Italian convention dedicated to the culture of play. Association between the game and the Bertinoro Municipality came as a natural consequence. The town itself owes the name to wine. The legend tells of Galla Placidia (roman empress buried not far in Ravenna) passing in Bertinoro. Tasting the local wine she commented “You are worthy of being drunk in gold” (literally “berti in oro”) thus the name of the town. Still today Bertinoro is an adorable little medieval town. In its walls are kept the historical reserve of Sangiovese wine, the fortress and the interreligious museum. But Bertinoro is especially famous for its Hospitality Column. In ancient times those who tied their horse to one of the rings of the column were welcome as guests by the family owning the ring. This tradition is still celebrated every year in september: official guests and simple visitors are invited to take one of the many envelopes hanging from the rings and put there by local families and restaurants. The owner of the envelope will be their guest for dinner. We send our Bacchanalia in the world with the hope that, apart from transmitting the exoticism and sensuality of the bacchanal, it will act as an ambassador for the welcoming and pleasure loving mood of Romagna. Yesterday // Bertinoro, 61 A.D.
Our reproduction of the roman Bertinoro has some basis of truth. Archaelogic findings and many roman writers talk about a Forum Druentinorum on the hills close to the Via Aemilia. The documents don't allow us to confirm the perfect coincidence between the ancient roman fora and the town of Bertinoro. The chance that the practice of the tertia hospitalitatis, widely practiced in IV and V centuries A.D., as the origin for the Hospitality practice is a fascinating hypotesis, but one still needing a deep historical analysis. The origin of the current Bertinoro settlement is to be searched for around the founding of the benedictine abbey of Saint Mary of Uranus, done by three monks from Britannia. To them is due the most probable origin of the toponym Bertinoro, born from the latin Castrum Brittanorum around the first part of VIII century. Since the end of X century, the available documents cite a turris maior in castro Brittinori: it's the first demonstration of a walled fortress on the top of the hill of Bertinoro. The document, showing the text of a placitum between the most relevant romagna nobles and the representatives of the archbishop of Ravenna is dated November 27, 995 and mentions repeatedly a defensive settlement destined to become the Bertinoro Fortress in the following centuries. The Middle ages represent for Bertinoro a period of rich cultural flourishing: the courtly tradition, harshly missed by Dante in the XIV canto of his Purgatory, creates the hospitality tradition that at the beginning of XIII century Guido del Duca will hold as a fundamental civilization value with the building of the Rings Column. After many different occurences, the Bertinoro Fortress becomes the town archbishop's palace in 1584 and so stays until 1969, when the Bertinoro diocese is included in the nearby Forlì one. After a long period of neglect, the Fortress becomes the base of the University Residential Centre and the Interreligious Museum. The compound that in the game hosts the thermal baths was in reality the ancient Corpus Domini Monastery which became the diocese seminary in 1817 until it's final closure in 1972. Today it is the guest room of the University Residential Centre. In today's Liberty Square we substituted the Rings Column, dating 1926 with the Jupiter Statue, while instead of the Saint Katherine of Alexandria Dome we put the Venus Temple. Finally in today's restaurant Cà de Bè we put the Bacchus Temple. What better than accompanying a game called Bacchanalia with a bottle of good wine? Especially since the game is set in a land committed since centuries to wine making? 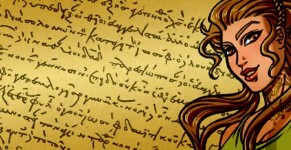 Game // what is bacchanalia? Bacchanalia is a narrative game for 3-6 people. Following the rules, each player creates a fictional character: a person accused (justly or not) of a crime against the empire and on the run with her lover. The game starts when the protagonists find themselves passing through Bertinoro, a settlement on the hills of Romagna by the Via Aemilia and close to the Ravenna port. Unfortunately for them, in that torrid summer, Bacchus and his followers came down to this village surrounded by vineyards. Attracted by the excesses brought forth by intoxication, other gods manifest themselves: cruel Pluto, severe Minerva and the sensuous Venus will play with the destiny of mortals with all the thoughtlessness only gods can have. In the chaos of the bacchanal, will the fugitives be able to reunite with their beloved and get to safety? Or will they meet a harsher end? Will they be caught by their accuser? Or will they be lost forever in the rapture of the bacchanal? To learn the answer, you only have to play a complete game. 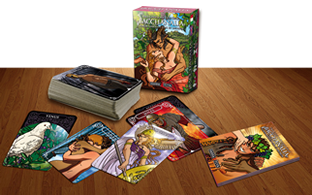 Bacchanalia is made of a deck of cards and a short manual. No preparation or experience is required to play the game, it is sufficient that one of the players has read the manual. A game usually lasts 2 ~ 3 hours, but there is an optional rule to set the duration of the game in advance. The players objective is to reunite with their beloved and run away. Each player in turn draws a hand of cards and, based on the results of the draw, describes a scene from the story for her protagonists. Elements of the scene vary according to which god was more present in the draw. For instance, a scene dominated by Pluto will feature a violent crime in which the protagonist ends up somehow involved. Benevolent Venus reunites lovers. 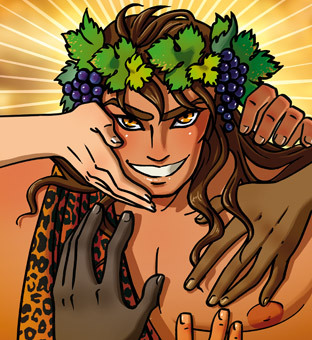 Bacchus brings thrill and excitement, and so on. How did we came to be publishing a game signed by Paul Czege & Michele Gelli together? 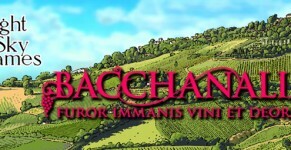 It all started in 2005 when Paul Paul Czege (My Life with Master, Nicotine Girls) published a game called Bacchanal. The premise is the same but the game is set in Puteoli instead of Bertinoro. The game is also based on a mechanic requesting a specific set of dice (purple, red, black, brown and golden d8, silver, white, purple d6, a pearly white d4), a tray to put in the middle of the table and a wine glass for each player. During the game the players roll the dice and take and put them in the tray and in each other's glass. We of Narrattiva were immediately enticed by this game, by its simplicity and sensuality. The only problem we saw to its broad appeal was the peculiar dice you needed to play the game: it would have been unusual to find people already owning such a set and to enclose the dice with the manual would have lead to scary production costs. But Michele didn't allow this problem to stop him, and he started devising a way to replicate the randomness of dice through the cards. The project developed through the years and many playtests to find the right balance in all of the components. 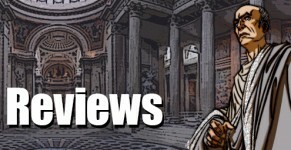 In this time we also made some adjustments to the rules, like those to set in advance the duration of the game or those to encourage players to reincorporate in their story parts of other's fiction, or the rules that explore the characters personality and their relationship with the beloved. To top all this we put a great effort in creating a game pleasant under every point of view: from the paper quality of the paper quality of the cards to the print of the same to the care for the illustrations which convey the game's feel and make the most immediate the meaning of each card. Welcome in Romagna, land of the pleasures of wine, food and good living.